Since the advent of Wolvesmouth back in 2010, the underground dining scene here in LA has undoubtedly expanded in both breadth and vibrancy, and the format has become a legitimate venue to serve as the incubator for the formation of a "real" restaurant. 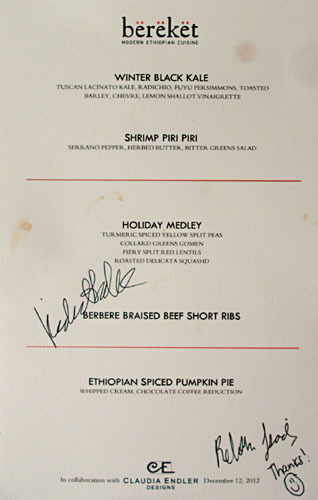 One of the more interesting concepts to hit the scene in recent times is modern Ethiopian supper club Bereket Kitchen, named after the Amharic word for "gift." Launched on September 9th, 2011, Bereket is the brainchild of sisters Kedist and Becky Tsadik, and is something that I've been curious to try out for the better part of the year. 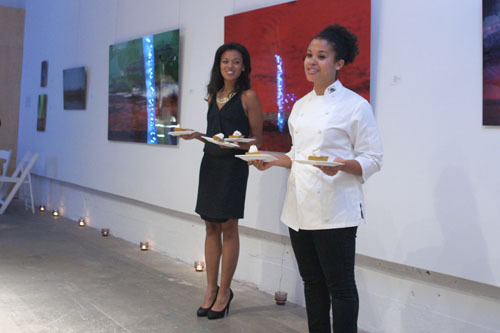 The idea for the supper club was conceived by Kedist Tsadik, who handles the front-of-the-house for Bereket. A graduate of Vanderbilt University (BS Communications '06), she worked as a commercial real estate finance analyst for CIBC World Markets before enrolling in the MBA program at UCLA in September 2009. During her tenure there, Kedist came up with the idea of Bereket after receiving positive feedback from her fellow classmates. 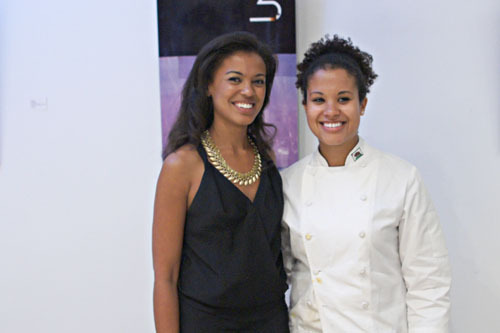 Invigorated, she decided to leave the world of real estate to pursue her love of the restaurant industry, and thus, convinced her sister Becky to return to Los Angeles from Chicago to start Bereket. Currently, Kedist manages Bandera restaurant in West LA, part of the Hillstone Restaurant Group (they also own Gulfstream, still my favorite place for crab cakes). Becky Tsadik, meanwhile, runs the kitchen for Bereket. She attended Northwestern's Medill School of Journalism, graduating in 2008, and worked in food marketing before deciding to pursue a career in the restaurant industry full-time. Becky cooked at Demera in Uptown Chicago, and during her tenure there, really developed a passion for Ethiopian cuisine, but also saw its potential to reach a wider audience. Following, she worked under Food Network Star winner and "Sandwich King" Jeff Mauro, further honing her culinary skills, and also served as head chef for a large mortgage company in the City. 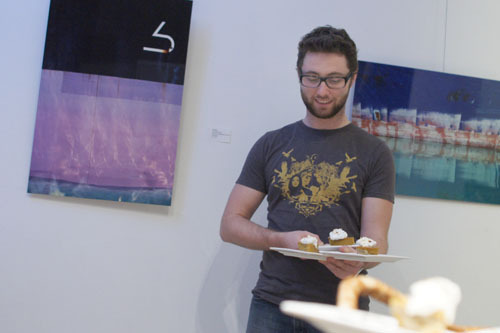 In 2011, Becky returned to LA at Kedist's behest to start Bereket, but has also staged at Joe's and The Tasting Kitchen in Venice, and worked with Brian Dunsmoor and Kris Tominaga at Wolf in Sheep's Clothing/The Hart and the Hunter. 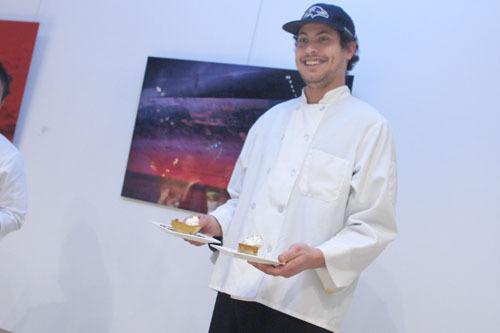 Her current role is at Cooks County with Daniel Mattern and Roxana Jullapat, and she even collaborated with Pheast's Isaiah Frizzell on a Valentine's Day dinner at Royal/T. 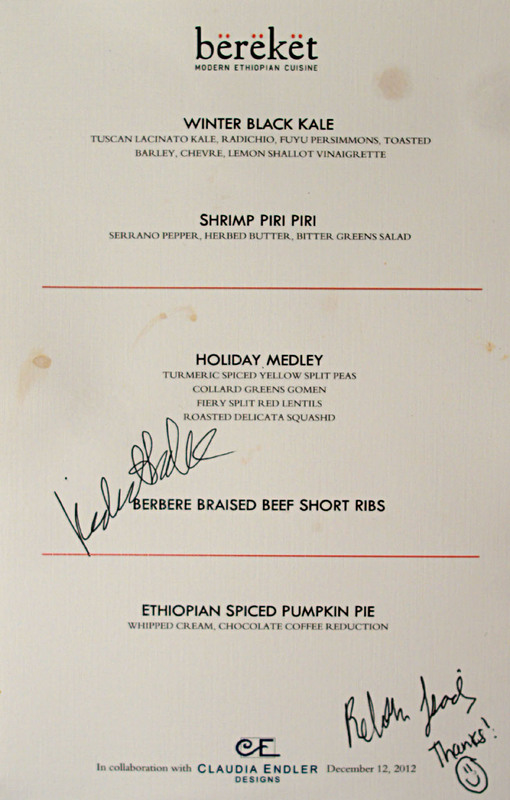 Bereket's menu tonight, a sort of holiday special, featured five courses at $70 (with a portion of the proceeds going toward charities in Africa). To drink, we were provided tej, a delicious Ethiopian mead (honey wine) made in-house by the sisters, but otherwise, we were advised to bring our own. Click for a larger version. To take full advantage of the BYO policy, we brought along fives bottles, which, out of sheer coincidence, managed to pair rather well with the five courses of food. 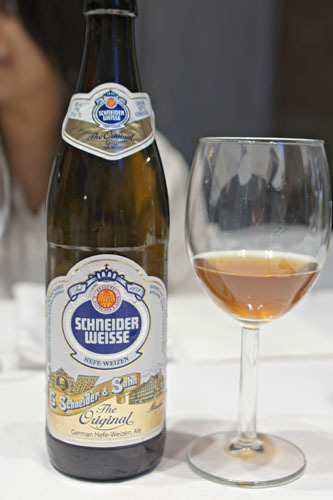 Our first was something on the lighter side, the Schneider Weisse Tap 7 Unser Original. This was a nice hefeweizen, though not quite what I expected from the style. There were the typical notes of banana and clove, but the sugary malt base of the beer was much more apparent than I'd anticipated, while the finish was drier, with a bit of astringency. The meal got off to a strong start with truly one of the tastiest salads that I'd had in a while. 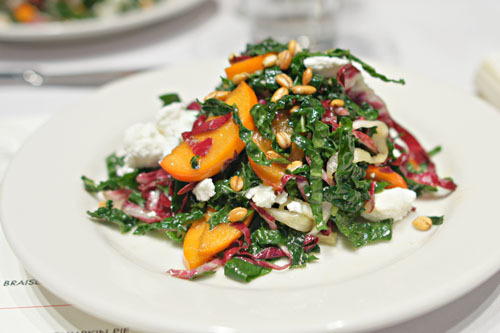 The interaction between the bitter greens and the sweet persimmons was spot on, and I loved the weight of the goat cheese, and how it was tempered by the acidity of the lemon here. At the same time, the barley provided a great textural component to the dish, making for a salad that was just utterly balanced and well-integrated. Next, we had a wine specifically recommended by none other than Akili Steward, whom you may recall from The Royce, Magnum, and The Dining Room. 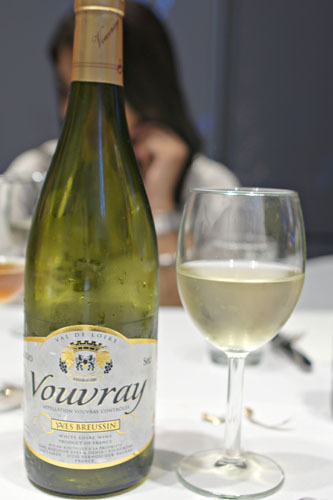 It was the 2010 Yves Breussin Vouvray Sec, a refreshing, light-hearted wine that was drier initially, but with a delicious body redolent of sweet fruit and overarching notes of lemon. The touch of minerality on this one was much appreciated as well. 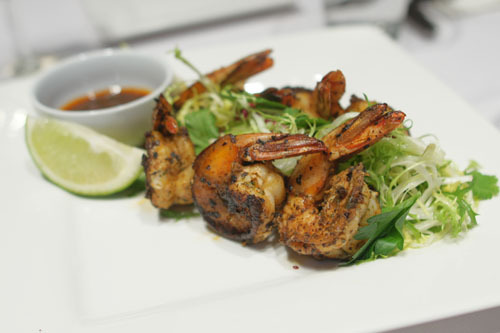 A sextet of shrimp was shared amongst three diners. I loved the relish of the piri piri sauce here, which provided a multifaceted blast of heat with a complex interplay of sour, spicy, and herb-y flavors. It went superbly against the shrimp, and surprisingly, didn't dominate their natural salinity, and I positively adored the salad here, which showed of a bitter, citrus-y kick that moderated the piri piri beautifully. My only concern was that I wanted the shrimp to be less cooked, and thus snappier in consistency. 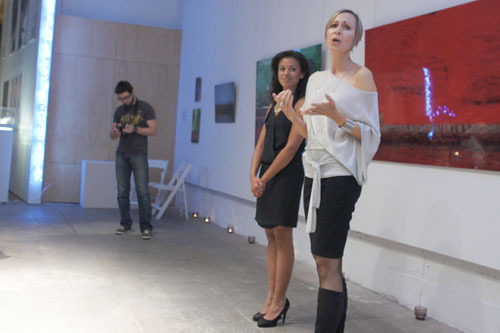 At this point in the meal, Kedist introduced Claudia Endler, who co-owns the building (the Telemachus Studio-designed Cero Gallery) and runs her own jewelry line, Claudia Endler Designs. Interestingly, the event space was actually one of Edison Electric's first steam plants back during the early 1900's, and eventually became part of the Pabst Blue Ribbon brewery. 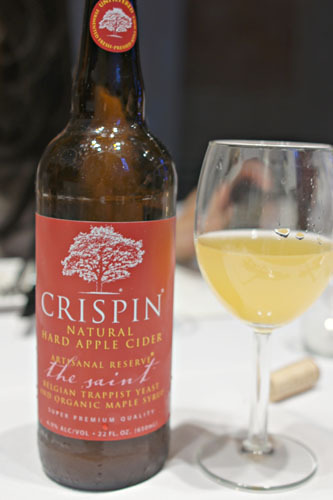 Up next was a cider, specifically the Crispin Artisanal Reserve The Saint, crafted using Belgian Trappist yeast. This one conveyed boatloads of crisp, honeyed, apple-y goodness, tinged by just a touch of funk and mustiness near the finish. An easy drinker. 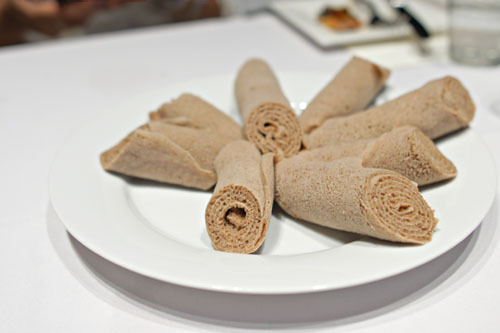 A plate of injera was placed before us, looking quite like miniature rolls of carpet! The bread was pretty marvelous: light, airy, and fluffy, with a distinct, almost sourdough-esque tang to it. Great for sopping up the food to follow. Contained within a shared plate that looked suspiciously like the Microsoft Windows logo were four items that just begged for a good going over with by the injera above. I began with the lentils, my favorite of the quartet, and loved their hearty, satisfying nature, laced with just the right amount of creeping heat. The chickpeas were delectable as well, with a great earthy character and a fantastic spice factor from the turmeric. Collard greens (gomen) were flawless, with a bitterness to them that did a nice job in offsetting some of the intense flavors at play here. Last up was the squash, which I found sweet, but fortunately not overwhelmingly so; the texture was spot on, too: a bit firm, but still supple, with a good bite. 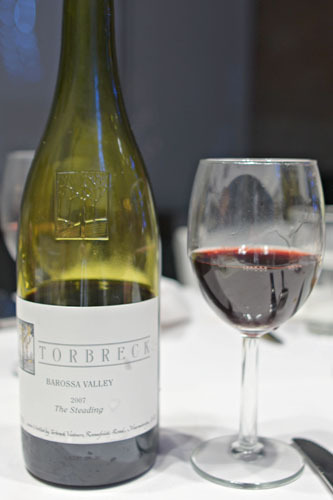 To pair with the heftiest course of the evening, we had a bottle of the 2007 Torbreck The Steading from Australia's Barossa Valley, a blend of 60% Grenache, 20% Shiraz, and 20% Mataro (Mourvèdre). This one packed quite a punch, showing off a slightly spicy attack leading to tons of super-jammy dark fruit on the midpalate, countervailed by some nice tannins and just a smidge of herbaceousness. 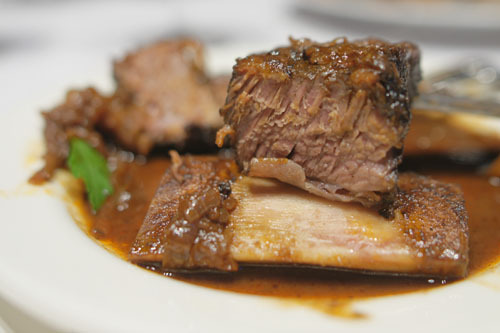 Our last savory course of the evening featured braised short rib, always a crowd pleaser. 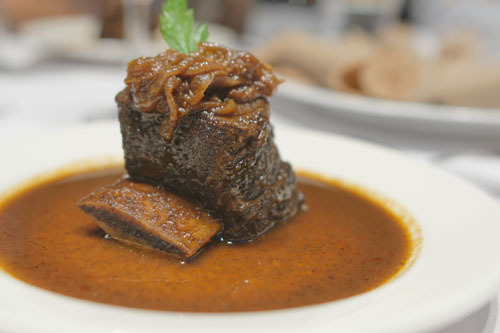 The sauce utilized here was of the berbere variety, and it was fantastic, displaying an intriguing combination of spicy, savory, and aromatic components that melded harmoniously with the beef. At the same time, a topping of onions provided a dash of sweetness to the fray that also worked with the meat. Delicious, though texturally, the ribs could've been more tender, more falling-apart. Before dessert, Kedist made sure to introduce Becky (who'd been in the kitchen the whole time), as well as the rest of the Bereket staff. 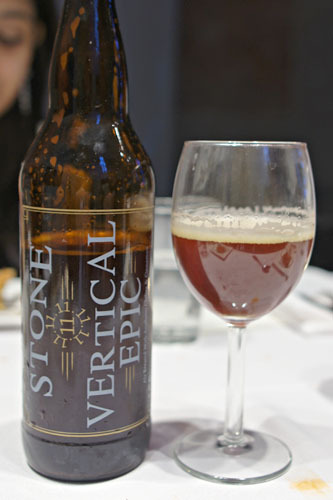 Our final tipple was a bottle of Stone 11.11.11 Vertical Epic Ale that I'd been saving for a year. I just had to bring this one out, given that tonight (12.12.12) was the exact date during which the beer should be drunk. It was actually the best food pairing of the night, conveying loads of cinnamon-y spice that complemented the pumpkin pie perfectly, along with a nicely balanced, sugary maltiness with hints of dark fruit and chili. 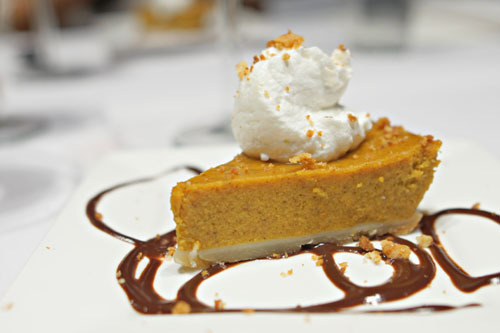 Dessert comprised an Ethiopian riff on the traditional pumpkin pie. All of the pie's classic character was there, with the sweet-but-not-too-sweet pumpkin working gorgeously with the various spices incorporated. The drizzles of chocolate-coffee, meanwhile, added further weight and complexity, while the dollop of whipped cream up top imparted just a touch of levity to things. 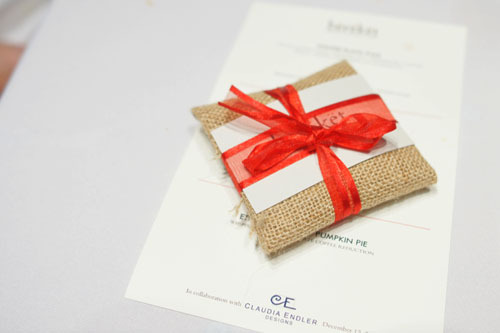 At the end of the meal, we were each provided packets of Ethiopian coffee, made with cloves, cardamom, and cinnamon. Seeing as how this was only one of the few times that I've had Ethiopian cuisine, I can't comment too much about the authenticity of the cooking. 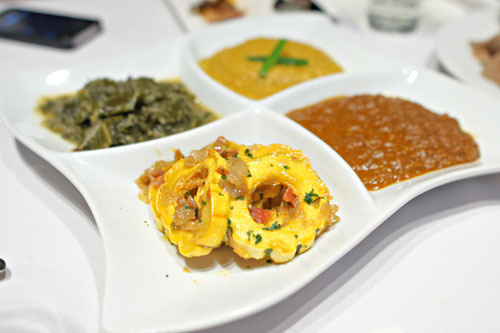 However, I can definitely appreciate the robust, soulful flavors that Tsadik has infused into the food, thus creating a unique combination in which old recipes are seamlessly imbued with a modern flair. It's a fresh perspective on traditional cookery, and I'm curious to see, and taste, more of it. Fortunately though, the duo is planning to open a permanent restaurant sometime next year, likely in Venice or Downtown, and you can bet that I'll be there, post-haste. not sure of the authenticity of the dishes. However, i am all for fusion and creativity. I would definitely visit their restaurant.